The Reporter (1949-1981) began in 1949 as an eight-page newsletter created to inform alumni, friends, and colleagues of the achievements and events of Northwestern University School of Law and its community of students, faculty, and alumni. The Reporter was originally a student publication, and its founding editors were members of what was then called the Junior Bar Association (now known as the Student Bar Association). 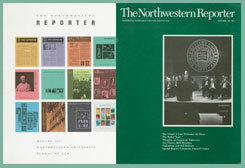 In 1981, it was succeeded by the Northwestern Reporter (1981-1997), and grew into a substantial magazine. Together the two publications ran for nearly a half century, chronicling everything from the Law School’s sponsorship of the first-ever conference of law reviews in 1949 to a 1996 program commemorating the efforts of Law School faculty and students in overturning the wrongful death penalty conviction of Rolando Cruz. In 2012, the magazine made a comeback with a new name, Northwestern Law Reporter (2012- ) and is currently in production. This digital collection was the vision of David S. Ruder, and the digitatization was funded by his generous support. Professor Ruder is the William W. Gurley Memorial Professor of Law Emeritus. A member of the Northwestern Law faculty since 1961, Professor Ruder was Dean of the Law School from 1977-1985, and Chairman of the Securities and Exchange Commission from 1987-1989. Shan Jiang was project manager for this digitization. Special thanks to Claire Stewart, Dan Zellner, and Paul Clough of the Northwestern University Library Digital Collections Department for advice, technical support, and loading content, and for hosting the collection in Northwestern Books. Scanning was performed by Backstage Library Works. Copyright 1949-1997 & 2011, Northwestern University School of Law. Written request for permission is required for any publication, distribution, or transmission of images, text, or data presented in this collection, beyond that allowed by fair use. We are proud to highlight these digital collections created by Professor Leigh Bienen. The interactive database offers a wide variety of searching options including searching by keyword, case number, offense date, defendant, victim, circumstance and victim/defendant relationship, etc. 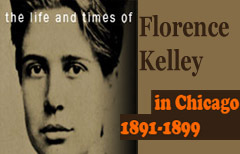 The Life and Times of Florence Kelley in Chicago, 1891-1899 is both a web site and document repository (archive) developed by Professor Leigh Bienen. The project related to the book Florence Kelley, Factory Inspector in 1890s Chicago, and the Children. Florence Kelley, a lifelong advocate for women and children, came to Chicago with her three children fleeing an abusive husband. She lived at Hull-House in the 1890s and was appointed state factory inspector by Governor John Peter Altgeld, becoming the first woman to hold that post in the United States. As factory inspector she and her colleagues worked to place children in school and remove them from tenement factories and dangerous industrial environments. With colleagues she conducted a wage and ethnicity census of the slums of Chicago at the time of the World’s Fair, resulting in the publication of Hull-House Maps and Papers (1895). Its findings and astute observations are relevant today. 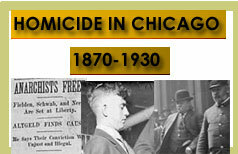 The book braids together three narratives: the story of Florence Kelley’s life as a mother and reformer in the tumult of 1890s Chicago; the story of the author’s arrival in Chicago a century later and her new life and work here; and references to wrongful convictions and exonerations over the course of a decade leading finally to the abolition of capital punishment in Illinois.